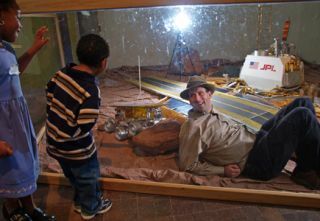 David Grinspoon, co-investigator for the RAD instrument, in a Mars Pathfinder display. The Mars Science Laboratory Curiosity rover has 10 science instruments, and each will be used in the coming weeks and months to help characterize the environment of Mars and determine if the planet ever had the potential for life. The Radiation Assessment Detector (RAD) studies the presence of radiation at the Martian surface for the first time. The instrument will be able to tell how much radiation is penetrating the Martian atmosphere to reach the surface. David Grinspoon, of the Denver Museum of Nature and Science, is one of the scientists that will use RAD to attempt to determine how the radiation will affect life that could have existed on or under the surface. What kind of research do you usually do? Well, I'm an astrobiologist, and I come from a planetary science background, so in a very broad sense, I study the evolution of planetary environments. I'm most interested in terrestrial or Earth-like planets, although I dabble in some other kinds of planets, too. What do you do specifically with MSL? The Radiation Assessment Detector for MSL will help to determine how much radiation from the sun and from space makes it through the thin Martian atmosphere to the surface. I am a co-investigator on the RAD team. RAD is the Radiation Assessment Detector, and it's an instrument that is allowing us for the first time to directly measure the high energy radiation at the surface of Mars that can be harmful for life. But in some instances, it might also be beneficial for life. My role on the RAD team is to consider the implications for astrobiology. That involves looking at the effect of high energy radiation on complex organic molecules that could lead to life or could betray the existence of life. It also involves studying the effect of high energy radiation on living cells, potential life on Mars today and life in the past on Mars, and finally, the effect of radiation on populations of organisms. Radiation is one of the important factors in evolution. It causes mutation, and some level of mutation is actually good for evolution. We're measuring that at the surface, as well as trying to understand how it propagates into the subsurface. We're trying to understand the present day radiation flux, or the amount of radiation on Mars, to help us do a better job at modeling the radiation in the past on Mars when the planet had a different atmosphere and filtered radiation in different ways. Over the lifetime of Curiosity, are you expecting those numbers to change, or do you expect to get essentially the same measurements three years down the road that you're getting today? An artist's image of an older rover model showing RAD's 65-degree field-of-view as it studies the radiation that makes it through to the surface. We expect it to change for a few reasons. The main reason is that one of the major sources of radiation is from the Sun, and the Sun is changeable. In particular, there are solar flares and solar storms, and there are events that happen on the Sun that release streams of energetic particles. Some of them hit Mars, and we expect that to be happening occasionally while we're on the surface with Curiosity. We should be able to measure those changes directly as they happen, in response to changes on the Sun. Also, there are other kinds of more subtle changes. The eleven-year solar cycle changes the flux of galactic cosmic rays—the really high energy particles coming from outside our solar system. This is a case where a long lifetime of the rover, lasting many years, will help us because those changes occur over years. So for many reasons, we're hoping for a long, healthy life for our instrument and for the rover. Then, also, there are potential changes in altitude. As Curiosity climbs Mt. Sharp over the next couple of years, we may actually be able to measure subtle changes in radiation at different altitudes, because it's filtering through different amounts of the atmosphere. How does your work help to answer astrobiology questions? The first radiation measurements on Mars, taken by Curiosity's RAD instrument. Once we do that, we can do a better job with understanding what the radiation ought to be doing at different depths in the soil. On Mars, that's a big deal, because if there is life today, then it's probably underground. Radiation is one of two or three major threats to potential life in the near surface of Mars, so we can study how this compares at different depths to other threats, such as the presence of hydrogen peroxide and other strong oxidants in the soil that can destroy organic matter. But the question is, what is the depth at which complex organics aren't destroyed by these different processes? In a practical way, it can help with the Curiosity mission because we should be able to help with sampling strategy. One of the major goals of the mission is to search for the traces of organic evolution in the past of Mars and with our measurements we can give input into the depths and what kinds of locations on the surface might be most promising to find complex organics. Of course, any actual constraints on possible living cells in the present and in the past are very important, as well. The astrobiology community can then do a better job at understanding what the environment looks like in different depths of the Martian soil today and in the past, with respect to radiation, which was probably one of the major limiting factors for biology on a planet like Mars. Mars does not have an atmosphere and does not have a magnetic field today so the planet doesn’t have the protection from radiation that our atmosphere and magnetic fields provide us on Earth. My last question is, how cool is it to tell people that you're on the RAD team? I love it. It's fun because it's RAD, literally, but it's also "rad" figuratively and descriptively. It's a radical thing to be doing, to have helped propose and then operate and learn from an instrument on Mars. I can't think of anything that would be more rad and exciting. Yeah, we need to milk that some more.